Kaycie Stushek, WV Community Development Hub intern and 2016 Civic Life Institute volunteer. Putting on a Civic Life Institute is a big job. In 2016, we were fortunate to have the assistance of Kaycie Stushek, who at the time was interning with our friends at the WV Community Development Hub. 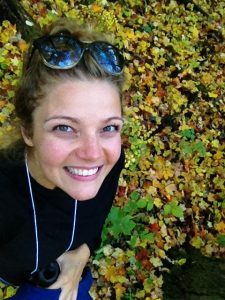 Kaycie is finishing a Master’s in Regional Planning at the University of Wisconsin-Madison, focusing on community development and environmental planning. She says that she is eager to come back to West Virginia after she graduates in May, to become immersed in the “sea of young change-makers” here in the Mountain State. After the Institute, we interviewed Kaycie about her experience. What experiences in your own life have shown you the value of or the need for the kinds of conversations we talked about? I came from an environmental education and outreach background. I saw a lack of implementation of social science-based skills in order to motivate and get people moving toward a goal. Often this training is seen as a ‘soft science’, and perhaps not as useful for those trained in hard sciences. I really see the need for those in the hard sciences (STEM) to be learn facilitation and moderating skills. Everyone is an educator of sorts, no matter what field we are in. Most professions/organizers need to know how to properly relay a message, gather consensus, help a group set goals, and to use their voice to achieve results. I think this institute was valuable in providing training, resources, and discussion around how to be the best communicator possible. What would you say to someone who says we don’t have time for “just talk”? I understand that in many processes and movements, actual work can get stifled by over-planning and over-researching. I think that small things like painting bike lanes, or making a pop-up market are low-hanging fruit that need to focus on action, or they may get stifled by planning. And those can be small wins that boost confidence in the group or community. There is value in making both those small wins and in making big wins that make larger change in the community. Both require different levels of planning and action. If there is low hanging fruit that requires less discussion and planning, go after that while you discuss and plan for larger projects that may take a few years. In those projects (as well as the low-hanging fruit), it is vital to gather support from a diverse group of people, and to make sure that important players are in the game. Having open discussions with everyone at the table is vital to moving a project forward in a way that is most useful for everyone. It also ensures that stakeholders won’t feel disrespected or left out, thus opposing the project and potentially stopping it. Time, money, resources, and relationships can be strained if proper planning is not done, and a project is killed. While it is important to move forward, our communities are made up of many people, all of which should be at the table. What was a particularly meaningful moment for you during the Institute? I thought a very touching moment occurred when we were sharing information about the opioid epidemic in West Virginia. Our conversation was focused on how addicts are mostly ostracized, and made into an “other”. The participants were making remarks about how this could happen to anyone, and it does not mean they are lazy or selfish or a bad person. Betty asked if anyone attending had had addiction touch the life of someone they knew whether a friend, family member, or themselves. Almost every single hand went up in the room. A few people shared their stories, and one shared her personal battle with addiction. This was in a room full of change-makers of Appalachia. She was a change-maker and her story and background did not discount that, it only make it her stronger and more effective. Care to share any specific insights or revelations you experienced during the Institute? I very much enjoyed when the attendees broke into groups and practiced moderating and facilitating around a specific topic. We all took turns at leading different sections of the conversation. Everyone dove right in and had genuine conversations that yielded very informative results. Afterwards, we each were able to give pointers and critiques to the moderator for their section. I got a lot out of both my critique and everyone elses. I learned that less is more when facilitating, and to let the people take ideas to their natural completion. I also learned how to pull out pieces of the conversation and use that to tie key points together and to move forward onto the next subject. We had some very skilled facilitators and recorders. I really saw how it is like an art, with so much thought that goes into it. What tips or techniques are you most likely to try to use soon, and what is it about them that seems useful? I am definitely going to use the facilitating and recording tips I received. I think a good facilitator allows people to be and feel heard, and is able to notice trends in the conversation and bring them up to the group to consider more. I always want to make sure the goals of the group are seen and correctly identified. I really enjoyed the World Cafe, where it was centered around creating discussion with very low pressure. Often times, people can feel put on the spot, but smaller groups enable genuine conversation and enable ideas to be heard from all people. Previous Post Are you missing a key team member?